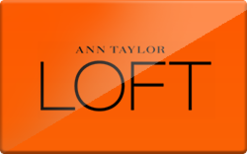 If you love contemporary style, then you will love a discounted Loft gift card! Not only do they offer fantastic casual clothing, accessories, and shoes in all the latest styles, but with departments in petite, maternity, and tall, there is something for every young lady! If you love the look, but don’t love the cost, then grab your discounted card today and start saving money right away! Remember, gift cards make excellent presents too! I’m not just talking about hip clothes, here. Your discounted Loft gift card will save you money on sunglasses, readers, bags, belts and more! What’s not to love about shopping, while saving money? And with 510 stores and 92 outlet locations nationwide, you are sure to have one close to you! Your card is good in any store, anytime. Or shop online and receive free delivery on all orders of $125.00+. Either way, you can’t go wrong. Finally, you can spark up your wardrobe, without breaking the bank! Established in 1996, as an extension of Ann Taylor, this store knows fashion. Purchase a discounted Loft gift card today and save money off your entire purchase. But that’s not all. Because gift cards are a form of currency, all other coupons and promotions remain! For extra savings, make sure you check out their fantastic sales sections for super deals you won’t want to miss! Not only will a Loft gift card get you more chic clothes for the money, but we offer many other discounted gift cards too! If you would like to save money on everything from pet shops to restaurants, then be sure you check out our listings for Ann Taylor, Bebe, Abercrombie & Fitch, Express, and more! Cards2Cash understands how difficult it can be to save money and we bring you as many discounted gift card options as possible! Do you have a Loft gift card you’re not going to use? Sell it to Cards2Cash! We’ll pay you top dollar for it! Just stop in one of our retail locations for cash on the spot, OR fill out our easy online form and we’ll get back to you with an offer you’re sure to love! Whether you want to buy a gift card, or sell one, Cards2Cash is your one-stop gift card shop!